Dog Poop, something no one wants to talk about (or clean up.) However, your dog’s poop can reveal a lot about his health. Consistency, color and frequency can all be indicators of problems. 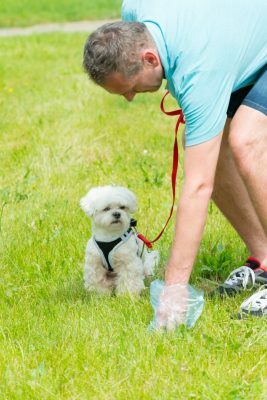 Nobody likes cleaning up dog poop but paying attention to certain aspects of your dog’s poop can help to detect health problems early on. And, since it needs cleaned up anyway, take the opportunity to check out these characteristics of your dog’s smelly gift. What is Normal Dog Poop? Normal can vary from dog to dog but generally speaking, normal dog poop will be firm and moist with a medium to darker brown color, similar to chocolate. It is also usually shaped somewhat like a Tootsie Roll. Why is my Dog’s Poop Yellow? Changes in your dog’s stool to a yellow color could be the result of something he ate. In this case, the yellow will usually appear in splotches in the poop as opposed to a solid yellow. Yellow dog poop can also be caused by something more serious, such as, liver problems or intestinal parasites. 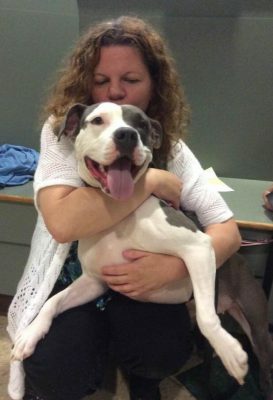 A trip to your dog’s vet is the best idea to rule out serious issues. Why is my Dog’s Poop Red? Red dog poop can also mean your dog has eaten something red. This is usually caused when feeding human table scraps to your dog. The red poop color is also caused by bleeding in the dog’s lower digestive tract. It can be the result of inflammation or if the dog is straining to poop. Why is my Dog’s Poop Green? Green dog poop can mean that your dog has eaten an large amount of grass or it could be a result of a more serious issue, such as internal parasites or the ingestion of rat poisoning. An immediate Vet appointment is necessary. Why is my Dog’s Poop Black? If your dog’s poop is a black tarry color or a maroon shade, it can mean he has bleeding in his upper gastrointestinal tract and is bleeding internally. An immediate trip to the dog’s Veterinarian is necessary. Why is my Dog’s Poop Runny? Runny, loose dog poop can happen anytime. And, usually does. Often, this is a result of changing your dog’s diet. Or, he may have been counter-surfing or garbage can diving. If this is the reason, the stool will return to normal in a short time. If it does not, or if your dog is showing other symptoms, such as; lethargy, loss of appetite or not drinking water, call your Vet right away. Why is my Dogs Poop Greasy Looking? A greasy looking dog stool can be a sign of Pancreatitis, which is an inflammation of the pancreas. This may be caused by too much fat in the diet from a high fat dog food or feeding table scraps. Why is There Mucous in my Dogs Poop? A certain amount of mucous in a dog’s stool is normal. It is produced to help lubricate and move food waste through the colon. An excess of mucous in dog poop can be a sign of parasites or even parvovirus. See your Veterinarian to check it out. Why are There White Specks in my Dog’s Poop? Small, white segments in dog poop can be pieces of tapeworm. You may also see very thin, wiggly worms within your dog’s poop. Take a sample to the Vet for treatment options. 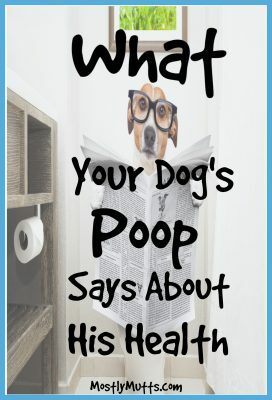 Why is There Hair in my Dog’s Poop? 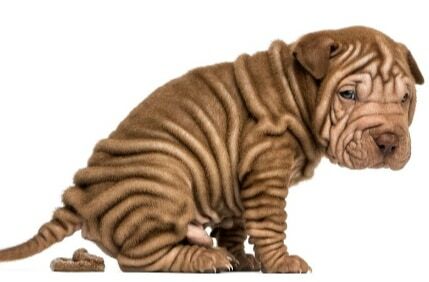 Hair in dog poop can be a result of excessive grooming on your dog’s part. Allergies or skin issues can cause your dog to lick himself excessively which will allow him to swallow the fur. What goes in, will come out. Check your dog’s skin for red or bumpy spots and pay attention to runny noses, sneezing and coughing which are signs he may have allergies. Check out these signs your dog has allergies for more help. You likely will need to take a stool sample into your veterinarian for a definitive diagnosis why your dog has a change in color or texture of his stool. Make sure the stool is fresh. Using a clean plastic bag, placed over your hand, gently scoop the sample into a clean, shallow plastic container. You can also try a plastic spoon of popsicle stick to scoop the stool into the container. Refrigerate the stool sample until transport to the Vet. The color and consistency of your dog’s poop can be indicators of health issues, both minor and serious. Your dog’s veterinarian is the only one who can give you the full scoop on what the changes in your dog’s poop means. Any changes should be checked out by your vet, especially if they persist and/or are accompanied by other symptoms, such as: change in appetite or water consumption, lethargy, vomiting or anything else that is unusual to your dog. Get your dog seen by his vet quickly to assure his return to good health. « Are Rawhide Bones Bad For Dogs?